March 26 - In two jam-packed appearances this weekend, Afghan feminist leader Malalai Joya reached at least 1500 people with her denunciations of the U.S. occupation of Afghanistan. She spoke with Professor Noam Chomsky to 1200 people at Harvard's Memorial Church Friday night and to 300 in Jamaica Plain this afternoon. The Harvard event was the largest single Boston area event focused on opposing the Afghanistan war since the war's start almost ten years ago. 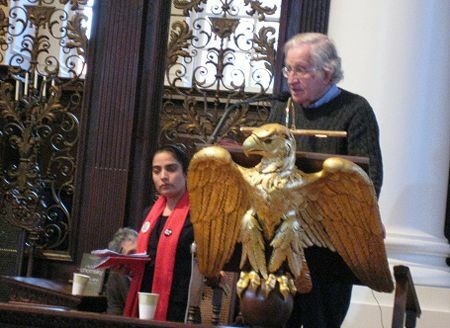 Malalai Joya and Noam Chomsky in Boston on Mar. 25, 2011. The U.S. State Department initially denied Joya a visa, even though her publisher, Simon & Schuster, and antiwar groups had lined up a three week speaking tour with dozens of speaking engagements coast to coast. After letters from at least a dozen Members of Congress, the American Civil Liberties Union, American Association of University Professors, and PEN, as well as 3000 online petition signatures and a phone-in day to the State Department last Wednesday, the U.S. Embassy relented and granted Joya a visa. Joya said that the Administration did not want to give her a visa because her message exposes the lies that justify the U.S. war in Afghanistan. She told her audiences that after 10 years of U.S. occupation and "development aid", Afghanistan ranks next to last among all countries on the UN Human Development Index, and that the conditions of Afghan women have not improved. Warlords and drug lords dominate Parliament and the Karzai government, Joya said, while U.S. troops kill civilians and rain destruction from the air. Afghan women and democratic people are caught between three enemies: the misogynist Taliban, the fundamentalist and misogynist warlords and Karzai regime, and the U.S. occupation forces. If the U.S. occcupation forces leave her country, Joya said that it will be easier, because Afghans will only have two enemies to fight, instead of three. 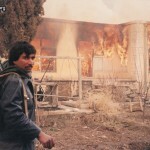 Joya said that the U.S. in Afghanistan for its own regional strategic interests, and not to help the Afghan people. She said that U.S. forces do not plan to leave by 2014, as President Obama has promised, but plan to stay a long time. Prof. Chomsky agreed that the U.S. military is not in Afghanistan or other countries for humanitarian reasons or to promote security or democracy, but to advance the interests of a corporate elite that controls U.S. policy. He pointed to the dangerous destabilization of Pakistan that has been driven by U.S. aid to the military there over many decades, by U.S. support of fundamentalist Islam which began under Reagan and continues via Pakistan to this day, and by the U.S. drone attacks in Pakistan which are causing many civilian casualties, and suggested that no one could possibly think these policies were intended to advance security. About 1200 people attended the event. Joya praised Chomsky's work in exposing U.S. imperialism, expressed her pleasure in sharing a podium with him, and said that although Presidents Bush and Obama have brought only grief to Afghanistan, Prof. Chomsky is an example of the freedom- and democracy-loving American people. 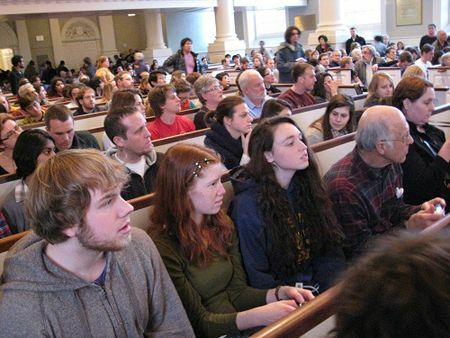 The Harvard event was sponsored by Haymarket Books, several Harvard student groups, the UJP Afghanistan-Pakistan Task Force, and Massachusetts Peace Action; at least 50% of the audience appeared to be students. The Jamaica Plain event was sponsored by Jamaica Plain Forum, Women's International League for Peace and Freedom, and several women's organizations; a majority of its audience were women. At both events the audiences gave multiple standing ovations to the speakers, interrupted the talks with applause, bought large numbers of Malalai Joya's books, and signed petitions calling on President Obama to end the Afghanistan war. The Boston Globe's report on the Jamaica Plain event is at http://bo.st/ffWdyy. 17.07.2009: Q&A: "The Killing of Women Is Like Killing a Bird Today in Afghanistan"
The war in Afghanistan costs US taxpayers two billion dollars a week, according to calculations made by the Department of Defense Monday.